Before learning what can be done with graphene, we need to know what can be done to graphene. 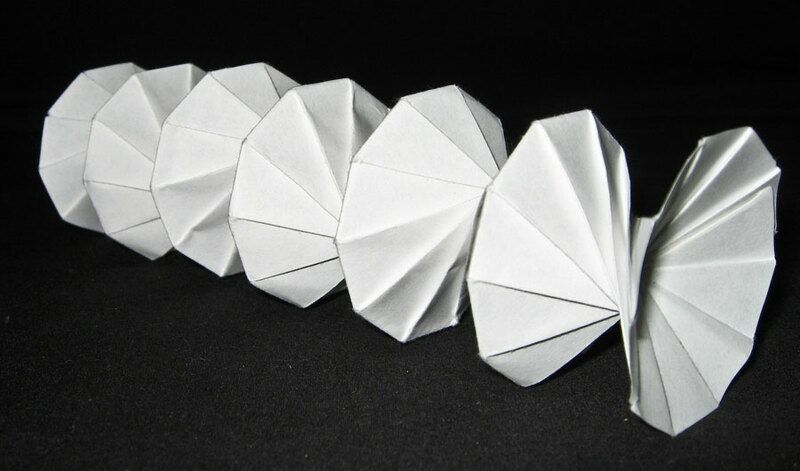 An origami spring made using a single piece of paper. (Inside Science) -- Graphene has long been touted as the next miracle material. A bulletproof vest thinner than a T-shirt? Graphene can make that happen. Transparent solar cells that look just like a window? Graphene can do it. An elevator that can take you to outer space? You guessed it -- graphene again. So, where can I buy a bulletproof beanie hat for my son? Unfortunately, the qualities that make graphene such an amazing material also make it hard to work with using traditional manufacturing techniques, which is a big reason why we don't have these futuristic gadgets yet. Graphene is flexible and tough, and it can conduct electricity up to a thousand times better than silicon -- the ubiquitous ingredient of today's electronic devices. From a smartphone's screen to its central processing unit, silicon is what makes electronic parts rigid. In principle, a smartphone made out of graphene components would be tougher, more flexible, faster, and more energy-efficient. While that all sounds very promising, scientists would first need to learn how to build things with graphene. "People have been learning how to cut and sew pieces of fabric together and make them into patterns for as long as textiles have been around," said Itai Cohen, a physicist from Cornell University in Ithaca, New York. Nowadays, researchers are applying these time-tested tricks of the trade to learn how to manipulate graphene -- but how do you stitch together a shirt out of something that is 10 times tougher than steel? Recent studies, including ones by Cohen’s colleagues from Cornell, have found that one can create microscopic structures with graphene sheets by combining laser cutting with origami and kirigami techniques, which are elaborate ways of folding and cutting traditionally used on paper. "Materials with different mechanical properties offer different advantages and disadvantages," said Cohen. "Take cloth for example. It's stretchy, which is good, but that makes it very hard to make folds that can hold, because you can't crease it the same way as you do with paper." David Nelson, a physicist from Harvard University, takes a slightly different approach. Instead of trying to fold graphene sheets into specific shapes, he and his colleagues want to see if they can tune the mechanical properties of graphene by cutting holes in them. Their findings were presented during last month's American Physical Society conference in Los Angeles. "We've found that if we make the graphene lacy by punching a regular array of holes, we can get it to crumple at certain temperatures," said Nelson. Part of their ongoing research was also published in Nature last year. A computer animation showing the behaviors of the perforated graphene (in blue), and the unperforated graphene (in red) in ascending temperatures from left to right. Video courtesy of David Yllanes. Since graphene is essentially just a single layer of interconnected carbon atoms, at high enough temperatures the vibration of individual atoms can cause the sheet to crumple up like a ball of tissue. Regardless of whether or not this is a desirable effect, it has remained largely irrelevant, since this only happens at extremely high temperatures -- more than 30,000 degrees Fahrenheit. Nelson and his colleagues have found that by making graphene lacy like a doily, they can lower the temperature at which graphene sheets begin to crumple by themselves. Their computational model can also predict at what temperature the crumpling would happen based on the size and density of the holes. In principle, future researchers can design perforation patterns that can make graphene sheets fold and unfold in specific ways at certain temperatures, like models from a pop-up book. "Ultimately we want to develop robots that can either swim or walk. Imagine a nanorobot with a hand that you can tell it to clench into a fist or open up," said Cohen. Medical applications are perhaps the most intensely researched field for nanotechnologies, and graphene is leading the way to help conquer the miniscule world of cells and molecules that is too small for even the steadiest of human hands.